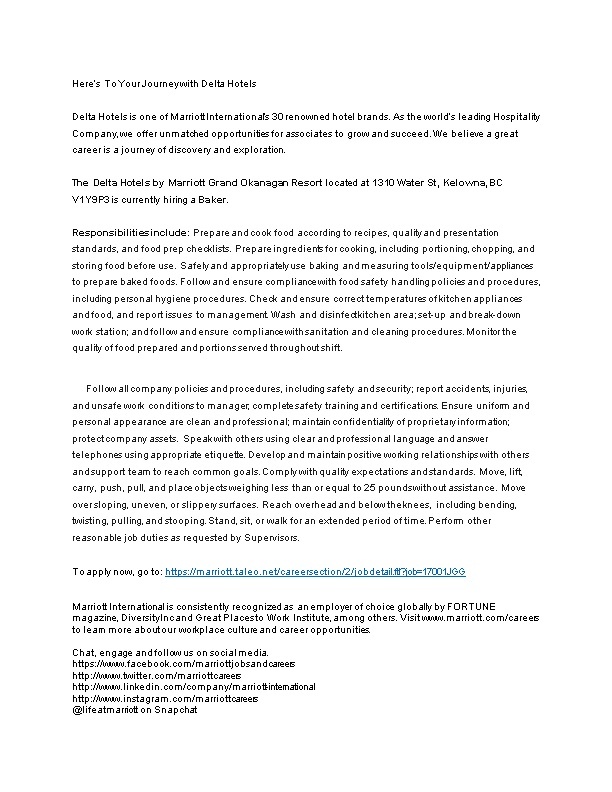 The Delta Hotels by Marriott Grand Okanagan Resort located at 1310 Water St, Kelowna, BC V1Y9P3 is currently hiring a Baker. Responsibilities include:Prepare and cook food according to recipes, quality and presentation standards, and food prep checklists. Prepare ingredients for cooking, including portioning, chopping, and storing food before use. Safely and appropriately use baking and measuring tools/equipment/appliances to prepare baked foods. Follow and ensure compliance with food safety handling policies and procedures, including personal hygiene procedures. Check and ensure correct temperatures of kitchen appliances and food, and report issues to management. Wash and disinfect kitchen area; set-up and break-down work station; and follow and ensure compliance with sanitation and cleaning procedures. Monitor the quality of food prepared and portions served throughout shift. Marriott International is consistently recognized as an employer of choice globally by FORTUNE magazine, DiversityInc and Great Places to Work Institute, among others. Visit to learn more about our workplace culture and career opportunities. Marriott International is an equal opportunity employer committed to hiring a diverse workforce and sustaining an inclusive culture. Marriott International does not discriminate on the basis of disability, veteran status or any other basis protected under federal, BC or local laws.